Peering up into Huntington Ravine. That is the question. It’s a question all hikers ask themselves before ever setting foot on trail. Or they should be asking, anyway. We didn’t hike yesterday for weather reasons — which is but just one of the things we consider. We were scheduled to guide a hiking trip through Huntington Ravine. Our guest had flexibility and so did we so we are working with him to better ensure a safe and successful ascent. The summit forecast and current conditions called for wet everything that morning, even though it wasn’t too bad in the valley when we read this. All parties concerned felt waiting was for the best. We chose condition no-go. This case was simpler than some. 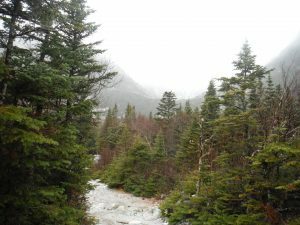 Fog, drizzle, rain, and wet rocks… well, for those who know, it’s not a good day for the notorious Huntington Ravine. In some instances, however, deciding is tough. It’s less clear. Sometimes, such as on those 50-percent-chance-of-whatever days, it may literally come down to the flip of a coin. It’s on these trips we may make it all the way or bail at some point enroute (being sure to leave that option open when it’s iffy). The author with his parents on Mt Washington. We said weather was a consideration this time. So let’s look more closely at that one, and let’s also explore some of the other things a prudent, prepared hiker will consider before making that could-be fateful decision of to go or not to go. In the case above, the current conditions — which we’re lucky to have remote access to — dictated our next move. Hiking Huntington Ravine requires traction at the onset via smearing, rubber to rock contact needed. Wet rock kills that. It’s wise to also consider the forecast weather trend. Is it expected to get better or worse. Will we have to come back in something nasty? How’s it going in with the wind at your back… better turn around to sample it as you go. All good considerations as mountain weather’s fickle. Seemingly this is more relevant this year than ever since there’s been a lot of rain (and a good snowpack to start the season right). Last year we were able to rock-hop every crossing in the Pemigewasset Wilderness. Not so this year, to be sure. We consider this going in. Other considerations might be time of day, when snow melt will be least in the morning. Or if it’s actually raining while we hike. The water levels will continue to rise if it is. No go! Your objective or objectives for the day may also factor into your decision to go or not to. If, for example, you’re all about the views and the weather calls for dense clouds and fog, picking another day is something that needs to seriously be considered. If you consider it, that is (that’s key). The attainability of the objective can be affected by anything we’ve noted so far (weather, crossings, preparedness). It’s not just about the views, safety plays a role here. Objectives have to be realistic based on a number of factors. Summit fever is unacceptable. Dreary day on Mt Washington. As mentioned already, summit fever is unacceptable. So why are you doing this? It’s okay to question your motives and objectives. Is it for a list, for fun, exercise, or any or all of the above? Are you completely obsessed, knowing you won’t get it for the GRID until next year if you do not bag it now?! Most hikers know — or they’ve heard stories, anyway — about people that were so driven, so determined, it may have led to their death. To go or not to go is the question, but is it the right question? Maybe why you want to go may need to come first. Several years ago I waited for an inconsiderate person with whom I was to hike to Mt Isolation with. They needed it (I had it). They never showed up; not even a call. The November weather was nasty. It should have been a sign to not go. Then, though, the drive took hours so I needed to do something. I decided to hike Mt Washington instead. Even knowing the trend called for dropping temperatures, I still pressed on! I checked in (and later checked out) with the Hermit Lake caretaker for safety and had an uneventful summit on a lonely mountain. I lucked out. The team, though, wasn’t intact and it should have affected my decision-making in a completely opposite manner. Such as choosing a much lesser mountain to hike, or just going for a second breakfast instead. In the example I gave above, I didn’t demonstrate the best judgement. I chose to go when, in fact, it would have been wiser to call a no-go. In addition to my choice to hike Washington, I made two on-mountain choices that day. 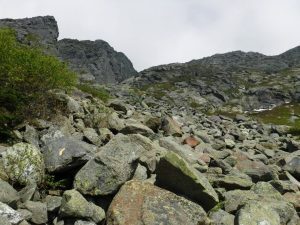 One was to ascend the Tuckerman Ravine headwall in wet but not yet frozen conditions (ice would begin to form by the time I reached the lip of the headwall, as I expected). The second was to continue to the summit instead of heading right down the Lion Head Trail, even though ice was forming (for which I was prepared with poles and light traction, as well as proper layers). I went on, summited, then descended Lion Head coated in ice, but otherwise just fine. My gut played a role. I was in familiar territory and I felt okay, even though I did question my reasoning as I went. If at any time my gut screamed at me, however, I hope I would have yielded to it. Other things may pop up affecting your decision-making. Stuff that’s out of your control such as the babysitter not being available to watch your toddler, or the friend who promised to watch your dog suddenly not being able to. Condition no-go? I’m not saying you shouldn’t bring the baby (my parents did), but are you ready for that? Or maybe the dog would like to go, too. Dogs, like people, can hike. But can it handle it? We know you want to get out there, but sometimes no-go is the better choice. But Those Mountains are Calling Wicked Loudly! 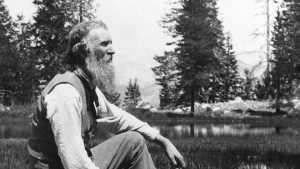 John Muir said that the mountains were calling and that he needed to go. We totally get it. The draw, the allure, that call of those sublime hills is a strong one. It tugs at us aggressively, grabbing us by the heart and by the mind through imagination and memory. It says go, go, go… but sometimes we can’t, or shouldn’t. The mountains will be there another day, they say (whoever “they” is). It’s a presumption, it’s true, but a very likely one so it’s safe to say. In any case, the act of thinking about this sort of thing brings you part way home. The rest should be easy now. UPDATE: It should be noted that the information under the heading “Preparedness” in the article above lacks discussion about gear. A no-go situation may be encountered if a hiker lacks appropriate gear. For example, it’s too cold for the layers they have, or they encounter deep snow and don’t have snowshoes, or ice without suitable traction. These are just a few examples. Lack of food or water, or availability to water, may play a role as well. It all falls under gear as one of the 13 Essentials.